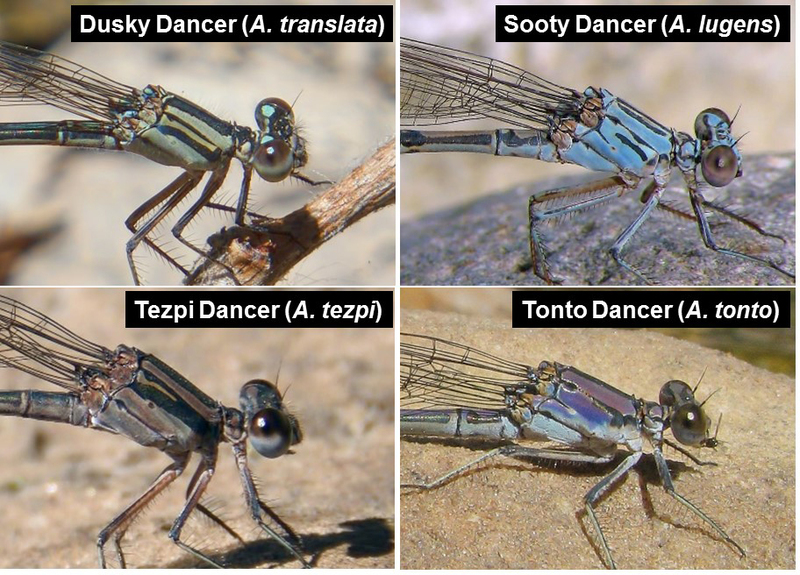 Four rather similar dancer (Argia sp.) species that are found in Arizona are the Dusky, Sooty, Tezpi, and TontoDancers. The Tezpi Dancer is confined to the southeast portion of the state, but the other three species are more widespread, can be found at a same location, and can be common. To separate mature males of the four species, focus on the size, wing and eye color, thorax color pattern, and abdomen color. In the hand, study the appendages, the shape of which is species-specific. Tonto Dancer: intermediate between Dusky and Sooty Dancers; average: 41 mm. Lateral views of the head and thorax of mature male Dusky, Sooty, Tezpi, and Tonto Dancers, AZ. The thorax of some male dancers undergoes a striking color change during mating. The pictures below show a Dusky and a Sooty Dancers in tandem. Compare with above pictures. Lateral views of the head and thorax of male Dusky and Sooty Dancers in tandem, AZ. 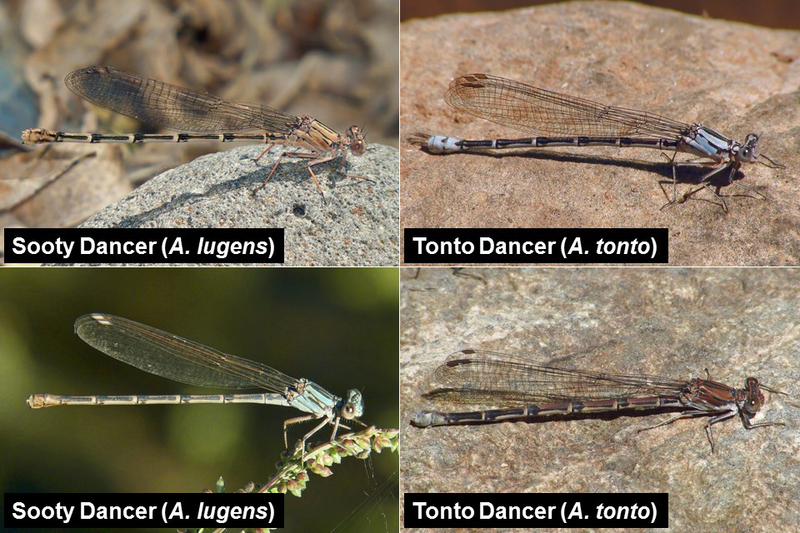 The shape of the male appendages in Dancers (Argia sp.) is characteristic of each species. 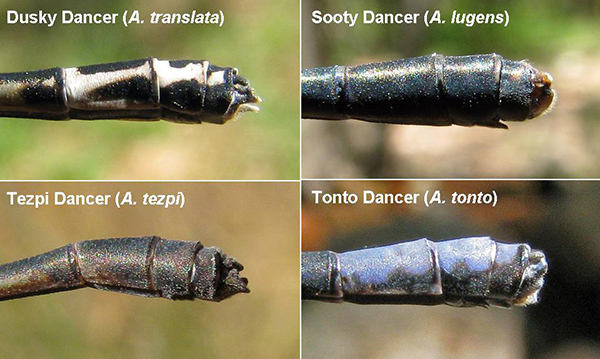 See below for pictures of appendages of the Dusky, Sooty, Tezpi, and Tonto Dancers. 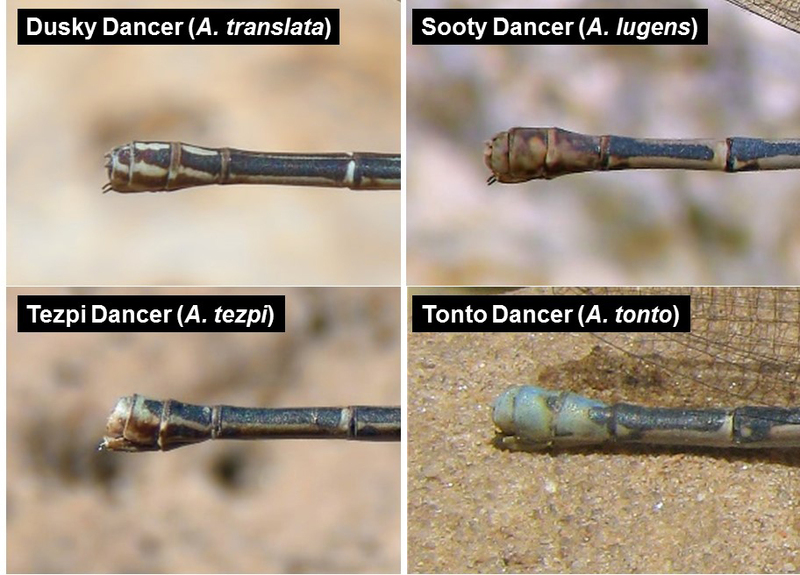 Lateral views of the appendages of the male Dusky, Sooty, Tezpi, and Tonto Dancers, AZ. 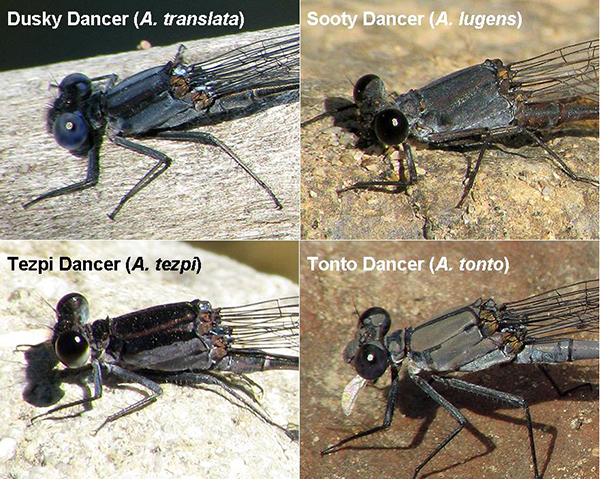 To separate females of the above dancer species, focus on size, wing color, thoracic coloration pattern, and coloration pattern of the terminal appendages. Overall coloration in female dancers can be quite variable as a function of maturity stage, temperature, and other factors. The following photos illustrate some of this variation for the Sooty and Tonto Dancers.